The enterprise data warehouse (EDW) has been at the cornerstone of enterprise data strategies for over 20 years. EDW systems have traditionally been built on relatively costly hardware infrastructures. But ever-growing data volume and increasingly complex processing have raised the cost of EDW software and hardware licenses while impacting the performance needed for analytic insights. 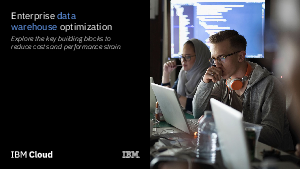 Organizations can now use EDW offloading and optimization techniques to reduce costs of storing, processing and analyzing large volumes of data. Getting data governance right is critical to your business success. That means ensuring your data is clean, of excellent quality, and of verifiable lineage. Such governance principles can be applied in Hadoop-like environments. Hadoop is designed to store, process and analyze large volumes of data at significantly lower cost than a data warehouse. But to get the return on investment, you must infuse data governance processes as part of offloading.